Activists have been planning a week-long series of demonstrations leading up to next week’s summit in Fermanagh. SOME 100 POLICE in riot gear have raided a building in central London related to an anti-G8 protest group, in advance of a demonstration planned for later today, according to the London Evening Standard. Members had promised the planned ‘Carnival Against Capitalism’ would kick off a week of demonstrations in the city running up to next week’s meeting of the leaders of the eight leading industrialised powers at a resort in Co. Fermanagh. 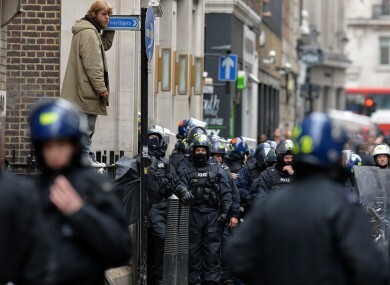 However, hours before this afternoon’s protest was due to begin, dozens of police dressed in riot gear descended on a squat in the Soho area where activists had been meeting to discuss final preparations. Officers formed a cordon around protesters as reinforcements waited in vans close by. A police spokesperson said a warrant was being executed at the building in question. The G8 summit is an annual meeting of government representatives from the world’s wealthiest countries: the US, UK, France, Germany, Italy, Japan, Russia and Canada. A huge security operation is being put into effect in Northern Ireland and around the border area in advance of the Lough Erne event. The PSNI have put a number of airspace restrictions in place to facilitate the transport schedules for VIPS like Barack Obama, Vladimir Putin and German Chancellor Angela Merkel. Over 900 gardaí have also been assigned to patrol the Co Fermanagh border. The meeting, which will takes place on the 17 and 18 June, will be the 39th summit to be held, and the first to take place in Northern Ireland. Email “100 riot police in crackdown on London G8 protests”. Feedback on “100 riot police in crackdown on London G8 protests”.